I always enjoy coming across an Indian comedy that doesn't rely on the slapstick and shouting that tends to characterize the genre and that isn't really to my taste. Chupke chupke ("secretly") is a funny, cute comedy that works because of a wacky script, the natural direction of Hrishikesh Mukherjee, and, most of all, because of the engaging and adorable charm of its leads. Parimal (Dharmendra) and Sulekha (Sharmila Tagore) meet on a hill station holiday in which Parimal, a professor of botany, impersonates hill station's caretaker in order to give the real caretaker a few days off. Parimal and Sulekha fall in love and marry - they are joyful and playful in marriage, but Parimal finds himself half-pretend jealous of Sulekha's brother-in-law Raghav (Om Prakash), whom she idolizes. So Parimal hatches a scheme - with Sulekha's full cooperation - to play a practical joke on Raghav, whom he hasn't yet met. He poses as a driver and gets himself hired to work in Raghav's household. Then Sulekha comes for an extended visit - ostensibly while her husband is away on business - and together they fool Raghav into thinking that they are having an illicit affair. Parimal has a couple of friends who are in on the joke - Prashant (Asrani), a Bombay businessman, and his colleague Sukumar (Amitabh Bachchan), a professor of English. Wacky hijinks ensue - Sukumar turns up impersonating the real Parimal, and falls in love with Prashant's sister Vasudha (Jaya Bhaduri). It's a massive prank for the ages. It's a totally stupid plot, and that's part of what makes it so funny - the other part is the utter good-enough-to-eat cuteness of the characters. 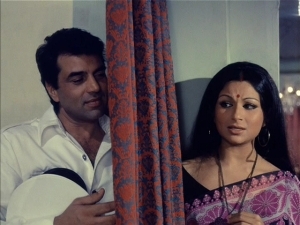 Dharmendra and Sharmila, as Parimal and Sulekha, have a delightful tenderness and mischief that just bursts out of the screen every time they give one another a naughty look. It's clear that they have fun with the pretense - as Darshana keenly observed on BollyWHAT, all the indiscreet sneaking around turns them on, so making their hosts think they are having a reckless and improper affair is easy. Parimal sneaks into Sulekha's bedroom nightly, once "accidentally" leaving his monogrammed hanky outside her door where Raghav will find it. And they gallivant openly in front of their hosts' five-year-old daughter, knowing that the little girl will tattle on them. The film is full of cute moments like that - the best of them is the song "Ab ke sajna sawaan mein," in which Sulekha sings a passionate song of longing to Parimal while Raghav looks on, vibrating as though he is about to pop a gasket. Amitabh is also wonderful as the nerdy, shy intellectual Sukumar. I love Amitabh's trademark angry young man persona, but even more than that I love his early roles where he gets to really show his range in a role that is different. Chupke chupke is one such - Sukumar is bumbling and bookish and not at all comfortable with the charade he's taking part in (unlike Parimal and Sulekha, who lie through their teeth with natural ease), and he's simply adorable. Adding to the comic absurdity of the whole situation, Raghav wants a driver who speaks perfect shuddh Hindi (why is not entirely clear - perhaps to protect his young daughter from the rough tapori spoken by the laborers available to him in Bombay) and the erudite Parimal, in his charade, is more than happy to oblige, offering language so pure and high-tone that others in the household can't always understand him - he takes Raghav's desire for pure language and throws it back in his face, with hysterical results. Obviously, to appreciate fully this set of running jokes, some knowledge of Hindi is helpful. But even without, if the basic idea is grasped - that there are different registers of Hindi, some perceived to be coarser and others more refined - then the humor is clear enough, and the subtitles on the edition I had (Bollywood Video) do work hard to make the concept clear, translating Parimal's high-register Hindi into overbearingly purple English.